My wife works in downtown Beaumont. She called me and told me that they locked down their building because a gunman was shooting and killing people at the Jefferson County Courthouse close to where she works. Fatal courthouse shooting suspect was on trial for sexual assault of a child according to Beaumont Enterprise. Beaumont Enterprise reports than only one person is dead and not 2 as reported by the courthouse bailiffs. The shooter is Bartholomew Granger who had a court hearing set for Wednesday afternoon. Four people have been shot, one fatally. Two were family members of the suspect while 2 others were bystanders. Three of the victims were shot in the parking lot. One was found in the basement of the courthouse. BEAUMONT - A man has shot several people at the Jefferson County Courthouse, including one elderly woman dead at the scene outside the courthouse, and at least three other people who were shot and survived, including another person shot outside the courthouse, one in the basement of the County Clerk's Office, and one at the Bus transfer station, according to information provided to KFDM News by Beaumont EMS and Fire. Police responded to the call of shots fired at the courthouse at about 11 a.m. The suspect left the courthouse and is inside the XCEL building two blocks from the courthouse at Milam and Park, next to the Chamber of Commerce. Employees have taken his gun and police are working to take him into custody. One woman in her 20's was taken by ambulance to a hospital. She had several gunshot wounds. Another victim was also taken to Christus with several gunshot wounds. 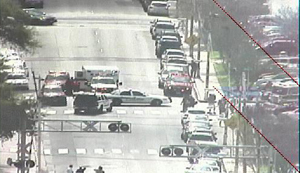 Scanner reports: At least two people are in the office with the shooter. Reporter Dan Wallach says by 11:45 a.m., the courthouse area was completely sealed off and officers in plain clothes were crouched behind cars in the parking lot with guns in the hands. Others were putting on bullet-proof vests, and some in camouflage with assault riffles. Courthouse bailiffs are reporting two fatalities. Reporter Heather Nolan, currently on scene, has talked to witnesses claiming there could be as many as five potential victims.